ValueHosted Review 2019: Is ValueHosted a Good Hosting? ValueHosted is a U.S. hosting company with a worldwide presence. They are newcomers to the hosting world but have a rock solid uptime service level agreement and 24/7 customer support. ValueHosted, founded in 2014, is a U.S. newcomer to the website hosting world. They claim to be “one of the leading I.T. providers globally” and have thousands of customers around the world. They have servers located in two worldwide locations: England and the U.S, and a third location, Pakistan, coming soon. Their website is available in English, with a Google translate plugin for around thirty languages. ValueHosted offers a range of hosting services, with a focus on website speed. Their services include shared hosting, virtual private servers, dedicated servers, domain registration, and SSL certificates. ValueHosted has servers located in data centers in London and New York. Both centers have multiple premium bandwidth providers and their servers have 1Gbps Uplinks. They have a third server location coming soon in Lahore, Pakistan, which they tout as expansion into hard to reach markets. All plans use CloudLinux, CageFS, and Secure Links, as well as RAID 10 SSD drives for faster disk read/write times and cPanel, which is widely recognized for being stable and reliable. For ease, all hosting plans come pre-loaded with WordPress, Drupal, and Joomla!. They have a rock solid service level agreement (SLA) for 99.9% uptime and detailed fair usage terms and conditions. They offer four plans of shared hosting which are called Starter, Personal, Premium, and Corporate. The Starter plan comes with 15GB SSD disk space, Personal plan comes with 25GB, Premium 40GB, and Corporate 150GB and one, ten, fifty, and one hundred domains respectively. 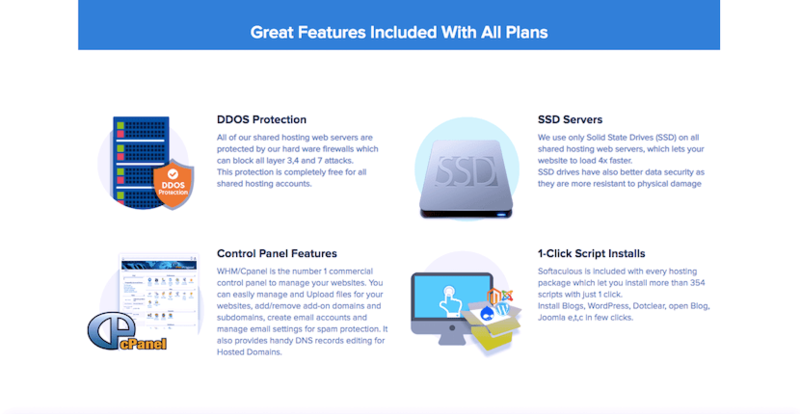 They all come with unlimited traffic, a premium offering of Softaculous with over 350 programs, DDoS protection, free instant setup, and free website migration. While it’s not explicitly advertised, they do support PHP (unspecified version). The Starter plan, which includes unlimited bandwidth and 15GB storage, is quite affordable, however, it only includes one website. If you need multiple domains, you’ll need to upgrade to the Personal, Premium, or Corporate plans, which are more expensive. That said, their servers are located in top locations, they have a solid uptime SLA, and use SSD storage, so the premium price point is understandable. You can buy their plans on one, three, six, or twelve month terms. Oddly, the monthly price is cheaper if you buy a month-to-month plan, instead of an annual plan. Domains are free in the two highest priced packages, while DDoS protection comes as standard in every plan. They run various coupon promotions on the website such as 10% off for the duration of plan. On the website, they advertise 24/7/365 support by email and live chat support 12/5, with a phone number listed, as well. For existing customers, there’s a client area which requires logging into access, and for both potential and existing customers, there’s a very substantial knowledge base. I tried to contact them, but unfortunately, the contact form on their website was not working and their live chat was offline. That said, they have lots of positive reviews of their customer service on third-party websites by existing customers. ValueHosted is a U.S. based hosting provider. They’ve been in business since 2014 and are already expanding into hard to reach countries, as well as providing excellent service in the U.S. and U.K. Wondering how ValueHosted stacks up against other Web Hosting companies? Enter any other Web Hosting company and we will give you a side-by-side comparison.